← Hands off my grandma. Challenging Representative Paul Ryan. Have you ever tried reading the lips of Republican Congressmen and Congresswomen when they recited the Pledge of Allegiance to the flag? Have you ever suspected that these Republican Congressmen and Congresswomen, and the entire members of the GOP, recite a different Pledge of Allegiance than the one we middle class Americans say? Do you know what they are really saying underneath their breath when the Pledge of Allegiance is recited at a public event?! The next time you have the opportunity to witness Republican Congressmen and Congresswomen recite the Pledge of Allegiance, try reading their lips to determine to whom as well as to what they are really pledging. You might be very surprised. 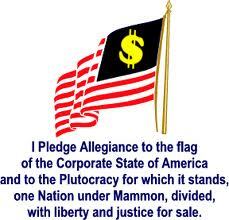 Here is the official Republican, the GOP, Pledge of Allegiance. with all power and money just for me…. This entry was posted in Accountants CPA Hartford, Articles and tagged pledge of allegiance to corporate america, pledge of allegiance to the rich, Read their lips, Republican pledge of allegiance, the barefoot accountant published the GOP's pledge of allegiance, The Official Republican Version of the Pledge of Allegiance. Bookmark the permalink. One Response to The Official Republican Version of the Pledge of Allegiance. Read their lips!